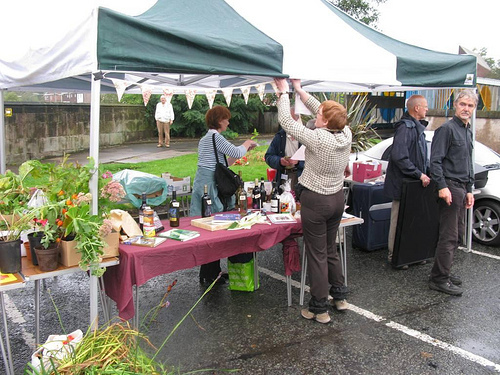 FRECCLES celebrated its 5th Birthday with an open day at the station and gardens on Saturday 11th September, officially opened by the Mayor of Salford, Cllr George Wilson. 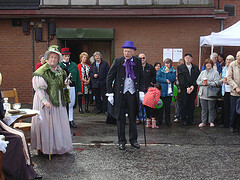 Visitors were treated to live music from Salford Schools music service, miniature train rides plus a static display of historical miniature locos from Walton Park Trains in Sale, a play in period costume from Barton Theatre Company, "Journey's End for Mr Huskisson!" about the events on the first day of the opening of the railway in 1830 (cast included our very own Chairman David Yates as "an eminent (and beautifully dressed) surgeon") and guided tours of the gardens that FRECCLES has been working on over the past five years. Children (of all ages) were able to make badges with GRUMPY's art workshop staff and enjoy outdoor games with Clarendon Road School and Ready Steady Store of Worsley. Sustenance was not far away: Smiths Restaurant did us proud with their "Wheel Tapas" takeaway menu and the Rotary Club of Eccles had their Eccles cakes stall. Eccles Sixth Form centre students proudly displayed their latest artworks for the station, a collection of posters recalling the history of the station and times past plus looking forward to the future. These posters will soon be displayed on the station in poster cases supplied by Northern Rail. It was also the launch of the second volume of "50 More Days Out from Eccles Station" which proved equally, if not more, popular than the first volume, selling out on the day! 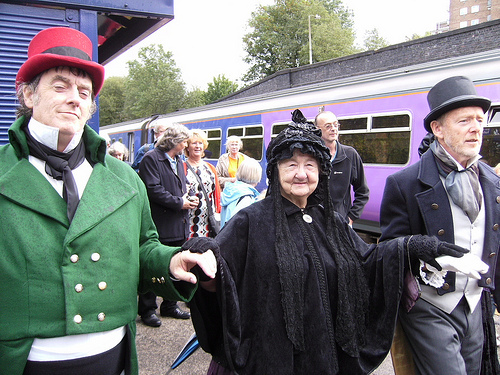 A highlight of the day was a chance for visitors to enjoy a free "Royal" train trip to Patricroft, courtesy of Northern Rail, with Queen Victoria going back to the station she last visited in 1851. Her Majesty was met by members of FrOPS, who gave a guided tour of their station and the local area including the first railway pub (Queens Arms, named in honour of Her Majesty's first visit) and the Nasmyth Steam Hammer. Later in the proceedings, the ladies of Urban Dervish gave a demo of their wonderful belly dancing, cheerfully carrying on against the elements and their wonderful costumes soaking up the rain. 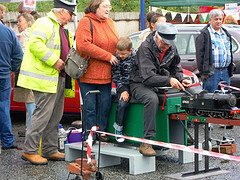 We are all very happy to celebrate our first five years as Friends of Eccles Station and the 180th Anniversary of the railway with our open day and despite intermittent and sometimes heavy rain, everyone enjoyed themselves and we had a fantastic turnout on the day. Everyone at Freccles would like to say a very big thank-you to all our visitors, supporters, sponsors (see the list on our acknowledgements page) and those who donated prizes for our tombola and raffle for making this wonderful event happen. Here's to the next five years and beyond. There's an another report and a video of the Open Day at SalfordOnline , and more photos on our photo archive and on Facebook. 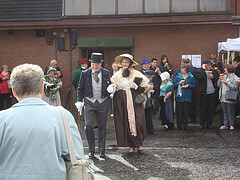 If you enjoyed our Open Day, please visit our Heritage Open Day web page and leave some feedback there.